It is an 8 Channel Isolated 5V 10A Relay Module, which can be controlled directly by a wide range of microcontrollers such as Arduino, AVR, PIC, ARM, PLC, etc. It is also able to control various appliances and other types of equipment with large current. Relay output maximum contact is AC250V 10A and DC 5V 10A. One can connect a microcontroller with standard interface directly to it. Red working status indicator lights are conducive to the safe use. It has a wide range of applications such as all MCU control, industrial sector, PLC control, smart home control. So, ready to get switching on your Raspberry Pi?! 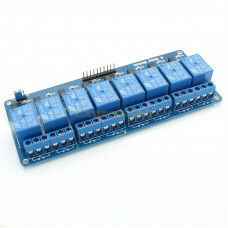 This neat relay module features 8 x 5V relays rated at 10A/250V each. t is designed to switch up to 4 high current (10A) or high voltage (250V) loads with the help of microcontroller! Each relay can individually switch to on/off state. It only requires a voltage of approx 1.0V to switch the inputs on but can handle input voltages up to 5V. This makes it ideal for 3.3V & 5V devices. The module is compliant with international safety standards, control and load areas isolation trenches.